Siriporn of Thailand designs a handcrafted wrap bracelet featuring the beautiful earth tone colors of agate and jasper. 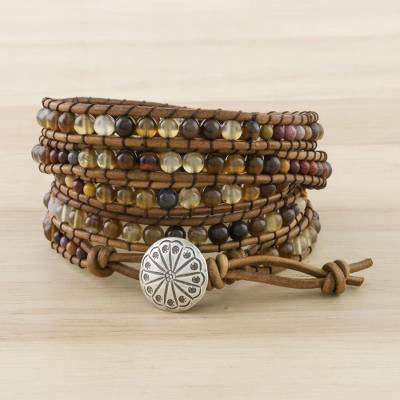 Round beads of the semiprecious stones are wrapped between two light brown leather cords. The bracelet can wrap around the wrist multiple times and is secured with a silver, flower stamped button from the Karen hill tribe of Thailand. The ends of the bracelet's leather cords are knotted to form two options for securing the silver button for ease in adjusting the bracelet's length. You can find agate and jasper beaded wrap bracelet 'River Road' by Siriporn in jewelry categories such as Hill Tribe Bracelets, Birthstone Bracelets, Agate Bracelets, Jasper Bracelets, Leather Bracelets, Silver Bracelets, Fine Silver Bracelets, Wrap Bracelets and Beaded Bracelets. Enjoy exploring these sections for other Novica treasures.